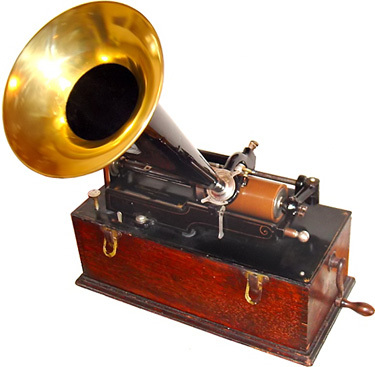 The phonograph is a device invented in 1877 for the mechanical recording and reproduction of sound. In its later forms it is also called a gramophone (as a trademark since 1887, as a generic name since c. 1900). The sound vibration waveforms are recorded as corresponding physical deviations of a spiral groove engraved, etched, incised, or impressed into the surface of a rotating cylinder or disc, called a "record". To recreate the sound, the surface is similarly rotated while a playback stylus traces the groove and is therefore vibrated by it, very faintly reproducing the recorded sound. In early acoustic phonographs, the stylus vibrated a diaphragm which produced sound waves which were coupled to the open air through a flaring horn, or directly to the listener's ears through stethoscope-type earphones. In later electric phonographs (also known as record players (since 1940s) or, most recently, turntables, the motions of the stylus are converted into an analogous electrical signal by a transducer, then converted back into sound by a loudspeaker. The phonograph was invented in 1877 by Thomas Edison. While other inventors had produced devices that could record sounds, Edison's phonograph was the first to be able to reproduce the recorded sound. His phonograph originally recorded sound onto a tinfoil sheet wrapped around a rotating cylinder. A stylus responding to sound vibrations produced an up and down or hill-and-dale groove in the foil. Alexander Graham Bell's Volta Laboratory made several improvements in the 1880s, including the use of wax-coated cardboard cylinders, and a cutting stylus that moved from side to side in a "zig zag" groove around the record. In the 1890s, Emile Berliner initiated the transition from phonograph cylinders to flat discs with a spiral groove running from the periphery to near the center. Later improvements through the years included modifications to the turntable and its drive system, the stylus or needle, and the sound and equalization systems. Predecessors to the phonograph- Several inventors devised machines to record sound prior to Thomas Edison's phonograph, Edison being the first to produce a device that could both record and reproduce sound. The phonograph's predecessors include Édouard-Léon Scott de Martinville's phonautograph, and Charles Cros's paleophone. Recordings made with the phonautograph were intended to be visual representations of the sound and were not to be reproduced as sound until 2008. Cros's paleophone was intended to both record and reproduce sound but had not been developed beyond a basic concept at the time of Edison's successful demonstration of the Phonograph in 1877. Thomas Alva Edison conceived the principle of recording and reproducing sound between May and July 1877 as a byproduct of his efforts to "play back" recorded telegraph messages and to automate speech sounds for transmission by telephone. He announced his invention of the first phonograph, a device for recording and replaying sound, on November 21, 1877 (early reports appear in Scientific American and several newspapers in the beginning of November, and an even earlier announcement of Edison working on a 'talking-machine' can be found in the Chicago Daily Tribune on May 9), and he demonstrated the device for the first time on November 29 (it was patented on February 19, 1878 as US Patent 200,521). "In December, 1877, a young man came into the office of the SCIENTIFIC AMERICAN, and placed before the editors a small, simple machine about which very few preliminary remarks were offered. The visitor without any ceremony whatever turned the crank, and to the astonishment of all present the machine said: "Good morning. How do you do? How do you like the phonograph?" The machine thus spoke for itself, and made known the fact that it was the phonograph..."
Edison's patent specified that the audio recording be embossed, and it was not until 1886 that vertically modulated engraved recordings using wax coated cylinders was patented by Chichester Bell and Charles Sumner Tainter. They named their version the Graphophone.